Slow Cooker Parmesan Garlic Herb Chicken is such an easy meal that is packed with amazing flavor! 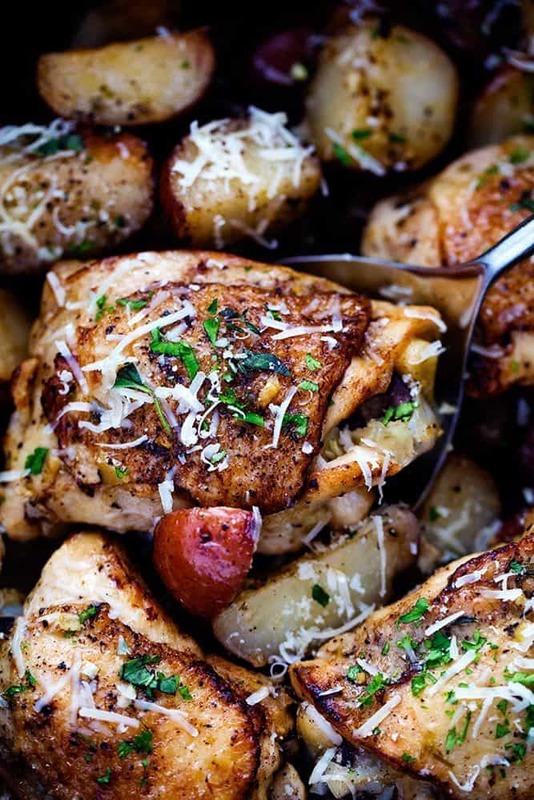 The potatoes cook to tender perfection in garlic, parmesan, and fresh herbs and the chicken is perfectly juicy. This makes a great meal in one! It is getting to be that time of the year for me where I am ready for more savory. You can only consume so many holiday treats and goodies before you are ready for less sweet and more savory. I think that is why the New Year is such a breath of fresh air after all of the holiday baking and treats consumed. Since it has been super busy around here lately. 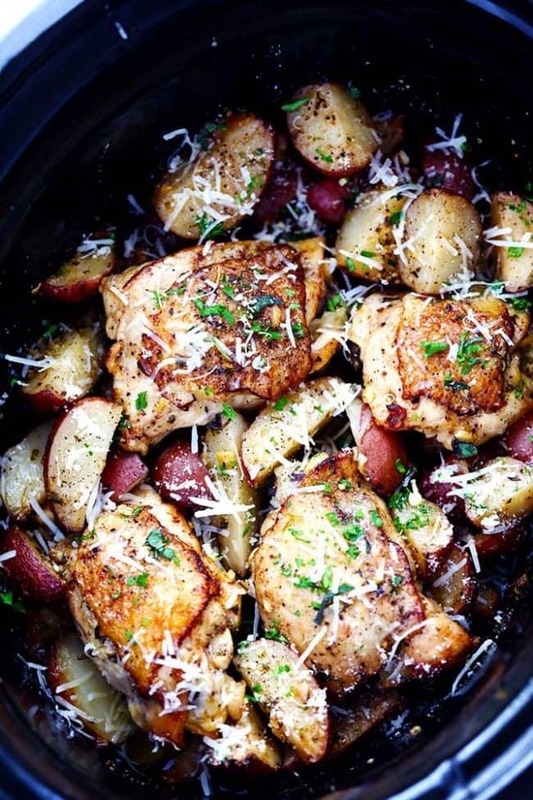 I love making slow cooker meals that is a meal in one and ready for my family at dinner time. My energy level starts to decrease quite a bit by the evening, so when I have a delicious meal ready for the family I feel like I am winning at life. This meal includes my favorite flavor combination everrrrr. Parmesan, garlic, and fresh herbs. It is amazing what these simple ingredients can do to bring out such amazing flavor and can be a meal that the entire family will devour. Potatoes in the slow cooker are my jam. I love any meal that has slow cooker potatoes involved. A little bit of crisp on the outside and so incredibly tender on the inside. 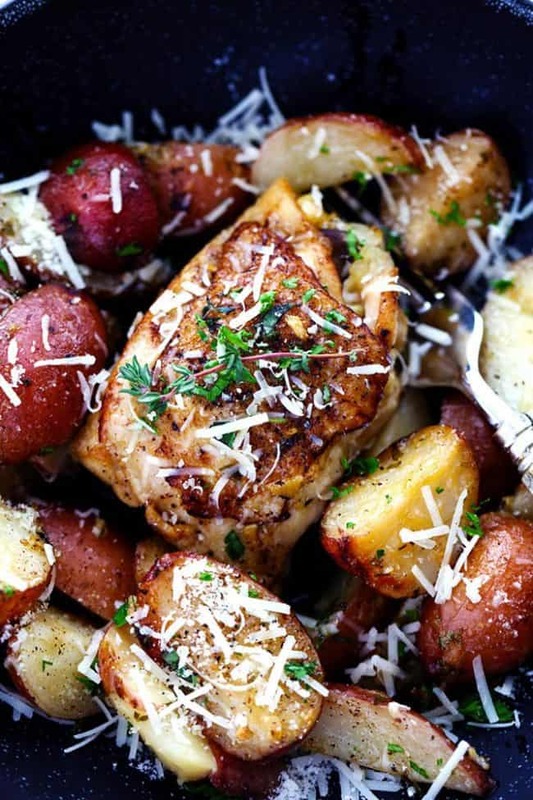 I used my favorite herb combination in these potatoes. Parsley, Thyme, and Oregano. You can definitely swap out one of those for your favorite herb. I love using fresh herbs in recipes when I cook, but you can also use dried herbs if you have that on hand as well. Any meat cooked in the slow cooker always comes out with a fantastic result. This chicken was so tender and juicy. I love pan searing the chicken before to help seal in the flavor and give that nice crisp edge as it slow cooks. The flavor is incredible in this meal and I know that your family will love it! It is so easy but full of such great flavor you will want to make it again and again! In a large skillet over medium high heat add the butter and melt. Salt and pepper the chicken and add to the skillet. Sear on each side for 1-2 minutes or until nicely brown on each side. Set aside. 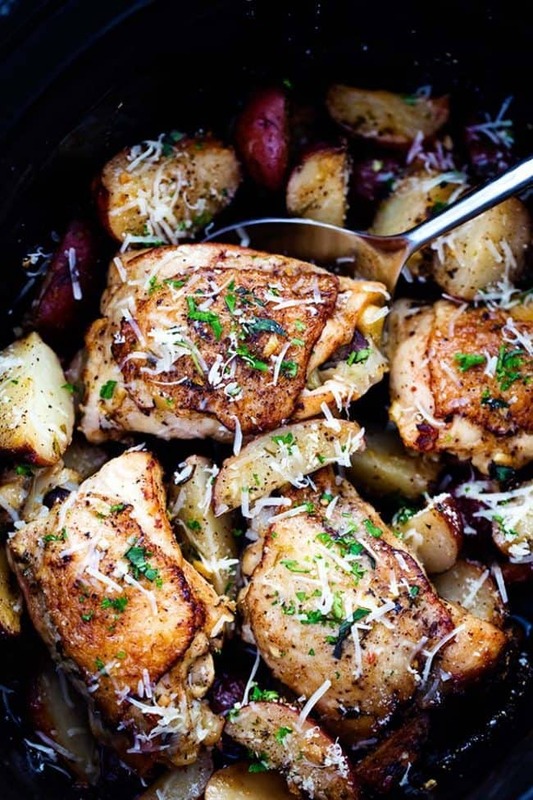 In a 5-6 quart slow cooker add potatoes, garlic, parmesan cheese, parsley, thyme, oregano, and mix. Season with salt and pepper. Drizzle in olive oil and mix until coated. Add the chicken to the slow cooker and cover. Cook on low for 6 hours or high for 4 or until potatoes are tender. Top generously with freshly grated parmesan cheese. Garnish with fresh parsley. he girl this looks so yummy! Did you remove the skin? Why would you remove the skin? The recipe calls for baby red potatoes, so I think you mean that you substituted white potatoes for the baby red potatoes. I wasn’t blown away by this. I am constantly looking for crockpot recipes with good flavor and I feel consistently let down. 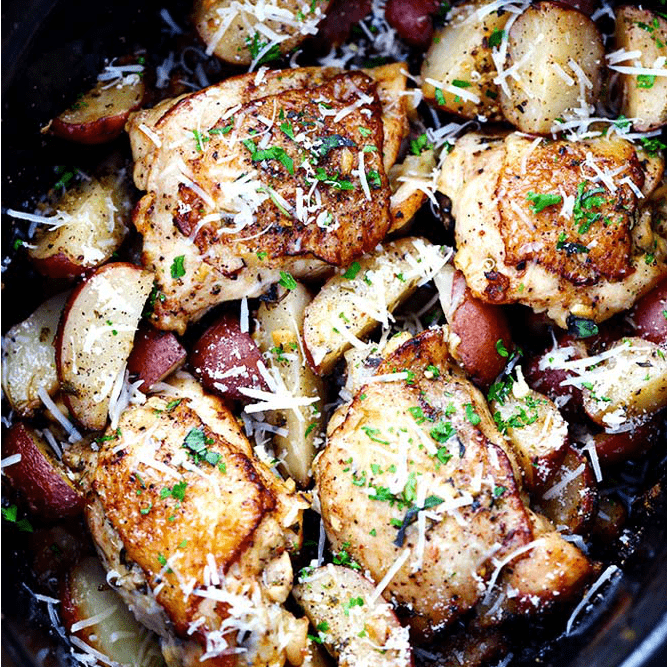 For this recipe, I even added dried herbs, since fresh herbs in the crockpot for this long are useless. I did top with fresh parsley. I consider myself a good cook an like lots of flavor but I rarely have good luck with crockpot cooking. Love, love, love this recipe! I’ve made it for my family multiple times and it always turns out great! Personally, I like to add about a quarter cup of chicken stock to the pan after I sear the chicken (just to catch all that extra seasoning left behind) and then pour the liquid into the crock pot! It makes for a great gravy after everything is cooked! This was delicious! I will make it again… and again! Frozen or thawed chicken breast? I made this and there is a fair amount of liquid in the bottom. Is that supposed to happen? The potatoes and chicken aren’t crispy on the outside like they were supposed to be. Can I do something next time to fix this? Did anyone answer this question? I’m having the same problem. There was too much oil. If I make this again, I will use chicken broth instead of the olive oil. I also added green beans which was a mistake. The potatoes and chicken were good, not crispy. Thank you so much for the recipe. I’m so excited to try it, but I was wondering if the chicken thighs should be skinless or with the skin on. I was also wondering whether I need to add water to the crockpot after searing the chicken on both sides, so that it doesn’t dry up while cooking. Thanks so much for the comment. I am happy to hear that you liked it! Thanks for following along. The flavor was good and the chicken was very tender. I had the problem a few others seem to have had though – too much liquid, which resulted in the potatoes not being crispy at all, and everything too greasy. Did anyone come up with a solution for this? Reducing the olive oil, maybe? I may try putting the leftovers under the broiler to see if that helps with the sogginess. Just made out my grocery list and making this Monday morning for dinner. Looks really good.